SAW003586 SCOTLAND (1947) [Unlocated]. Unlocated mountains, possibly near Ben Nevis. An oblique aerial photograph. Pennawd [SAW003586] Unlocated mountains, possibly near Ben Nevis. An oblique aerial photograph. Meall Dubh. I'm guessing - but the crew probably flew out of Dalcross en-route to Oban/Connel, and flew down the Great Glen(Track - 215T). 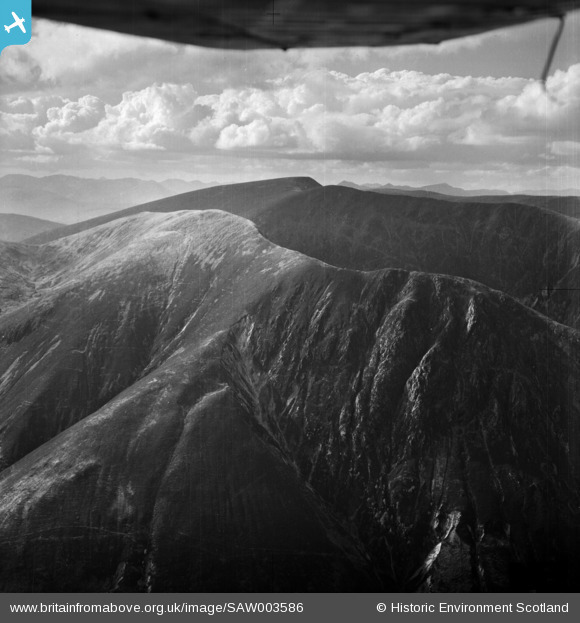 While over Loch Lochy and to the NE of Meall Dubh, they photographed it looking NW. The two deep gullies - centre right - can be seen clearly on Google Earth and the Ordnance Survey 3D app. These gullies flow into Dearg Allt on the map - this flows into Loch Lochy. Top left is the valley - Coire Leacachan - which lies between Meall Dubh and the summit to the SW - Meallna Teanga. The ridge line in the background at the top of the photo is between the summit Sron a' Choire Ghairbh to the west and Sean Mheall to the east. I apologise if I have misspelt some of the Gaelic names. Photo taken from the summit of Sron a' Choire Ghaibh with Meall Dubh to the right of the rear walker and the Nevis Range in the right background. I asked my son-in-law who has climbed all the Munros in Scotland if he thought SAW003586 was a photo of Meall Dubh and he concurred. He passed me this photo of his friends on the summit of Sron a' Choire Ghaibh. Riley - a German mountain dog - is running towards my Daughter. Weather looks good - they must have had an excellent day. North (or northeast) is probably off to the right of this shot - as suggested both by the lighting/shadows and the fact that the majority of glaciated cirques face somewhere between N and E. The patterns of gully erosion and smooth slopes suggest a mix of igneous rocks including perhaps granite, evidenced by the light-coloured stone field on the upper slopes. Looks like parts of the Mamores or Grey Corries but a match is difficult to make, so other search areas must come into play.